Quack! Quack! 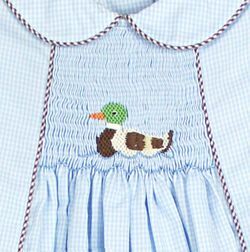 What an adorable small check light blue gingham long bubble smocked with an embroidered duck. 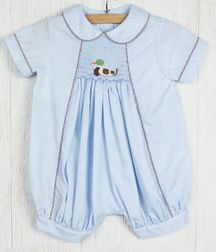 The short sleeve bubble has a Peter Pan collar and is trimmed in brown gingham. 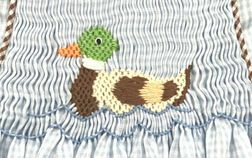 The center chest is smocked with a cute hand embroidered duckie!